The “scientific process” is the method through which an experiment is prepared, conducted, observed, and measured so that the scientists involved can understand each attempt’s successes and failures. In the case of a failure, hopefully they are able to isolate the cause and fix it for the next round of the experiment; in the case of success, the meticulous record keeping and observation allows the experiment to be recreated. The scientific process is one in which failure only requires one try, but success must be tested over and over again to ensure that the results are reproducible. There is perhaps no greater illustration of this contrast than in the rivalry between android superheroes the Metal Men and the sentient chemical cocktail known as Chemo. The Metal Men first appeared in Showcase #37: android superheroes created by Doctor Will “Doc” Magnus. All of the Metal Men possess the ability to change shape, but each is made of a specific element which both informs their individual abilities and also their individual personalities: Gold, the team leader, is able to stretch himself nearly infinitely; Iron is super-strong; Lead can form himself into powerfully dense shielding as well as being a dense thinker; Platinum can spin herself into extra fine filaments; Mercury’s hot-temper is mirrored in his ability to melt completely and reform himself; and Tin is smart but insecure. While they are far from the only androids in the DC Universe, they are unique in that they each possess such distinct personalities – a product of Doc Magnus’ invention, the “responsometer”, which converts the physical attributes of each android into a psychological attribute. The Metal Men have teamed up with many heroes over their long careers. In some cases, they have merged together to form Alloy, a single hero with all of their abilities. They are frequently damaged in battle, though sometimes members have been destroyed altogether. 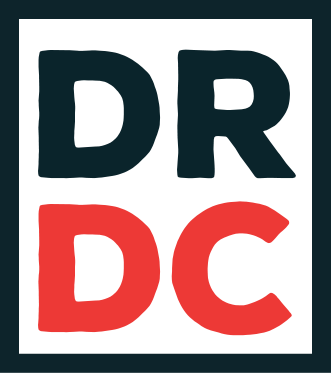 In all cases, Doc seems capable of repairing or rebuilding them completely, using their responsometers to keep in tact as much of their personalities and experiences as possible. Other metals have appeared as allies or as villainous versions of the team. Doc Magnus even transplanted his consciousness into the metal android Veridium and led the team for a time when Gold was killed beyond repair (Metal Men volume 2). In spite of these occasional changes, the original roster of the Metal Men has remained largely intact throughout their history. The Metal Men are also relatively unique in that they have never joined the Justice League or any other superhero team. Doctor Ramsey Norton developed a tough, durable container for the toxic waste from his chemical experiments which he named “chemo”. However, the mix of various toxic compounds and the remnants of Norton’s failed growth formula cause the vessel and the chemicals inside to come alive, becoming the sentient monster Chemo. Chemo kills his creator and goes on a rampage, where he enters the first of many encounters with the Metal Men. Chemo has the ability to change his size, usually growing to gigantic proportions. He possesses super-strength and a high level of invulnerability. Chemo can spray his toxic contents and is able to reform himself if destroyed or dispersed. Chemo has been used as a weapon of mass destruction on at least two occasions: during the Crisis on Infinite Earths he wiped out New York City on Earth-4, and in Infinite Crisis, the Secret Society of Super Villains dropped Chemo on the city of Blüdhaven, destroying it. Chemo has been a member of the Secret Society of Super Villains, the Injustice League, and the Suicide Squad (under the telepathic control of team leader Amanda Waller). The Metal Men and Chemo share a common origin in that they are both products of the scientific process. The obvious difference is that the Metal Men are a rousing, reproducible success – Doc Magnus has often repaired or completely rebuilt the Metal Men, and the process is so perfected that alternate versions have been formed out of much more unstable elements (Uranium, Radium, and Strontium, for example, were members of the Death Metal Men). Chemo, on the other hand, wasn’t even the focus of an experiment. He was born out of the unforeseen reaction of leftover chemicals from other failed experiments. Nothing was measured in his contents and since his first act after coming alive was to kill his creator, there is little chance he could be recreated. He is able to reform himself, true, but the process by which he was created is lost. 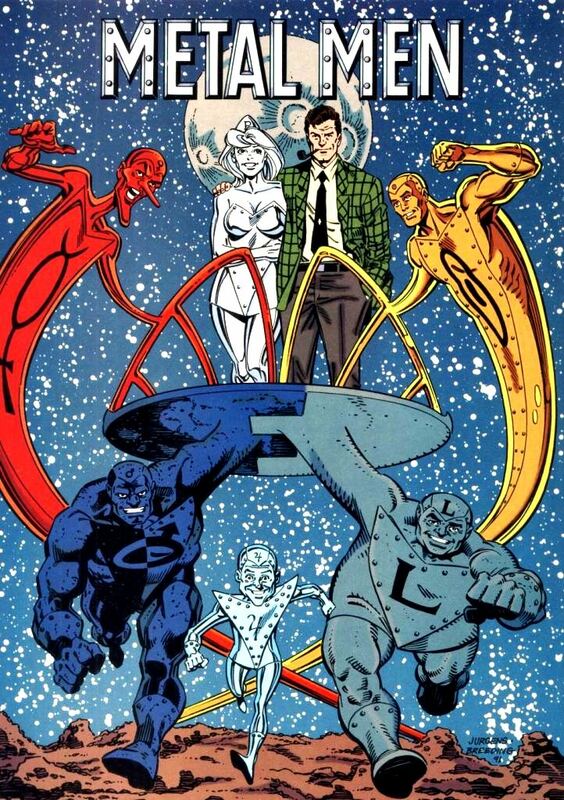 It is also interesting to note that the Metal Men and Chemo represent two polar opposite social forces – that of cooperation and that of assimilation, respectively. 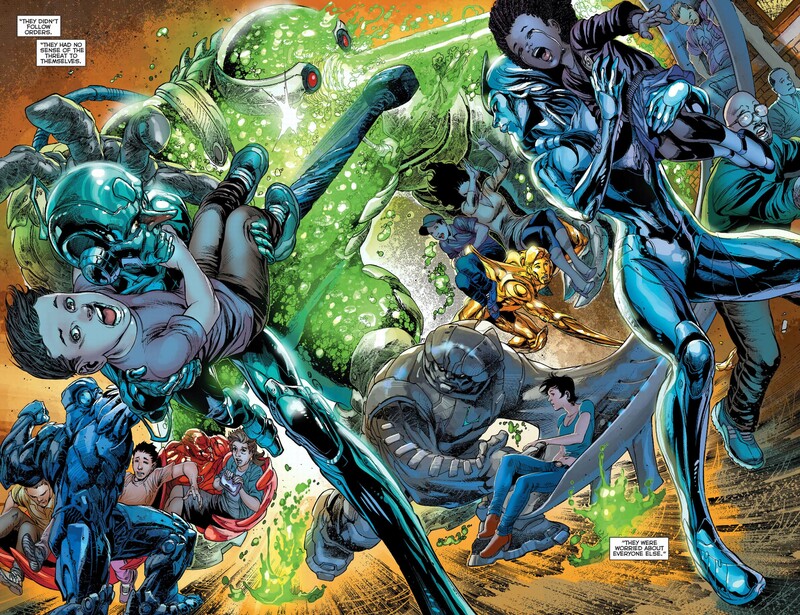 What sets the Metal Men apart from other androids in the DC Universe is their unique personalities. From Mercury’s hot temper to Lead’s slow wits, each member of the team brings not only a unique physical attribute, but a unique perspective to their missions and their relationships. This causes tension at times but it means that no matter the obstacle, at least one will have the perception or the ability to exploit a weakness and allow the team to emerge victorious. It is this cooperation that is the core strength of the Metal Men. By contrast, Chemo is a singular entity: an indeterminate amalgam of various chemical wastes which do not maintain their individual integrity within the containment vessel. In fact, it is the constant reaction of chemicals that creates Chemo, and though many different ingredients went into the mix, only one product came out. That very same process of reaction which created Chemo is the reason he poses such a danger to the Metal Men. While both exploit properties at the atomic and molecular level, the fundamental difference is that the each of the Metal Men represent a resting state of their individual elements, whereas Chemo by his very nature is reaction incarnate. 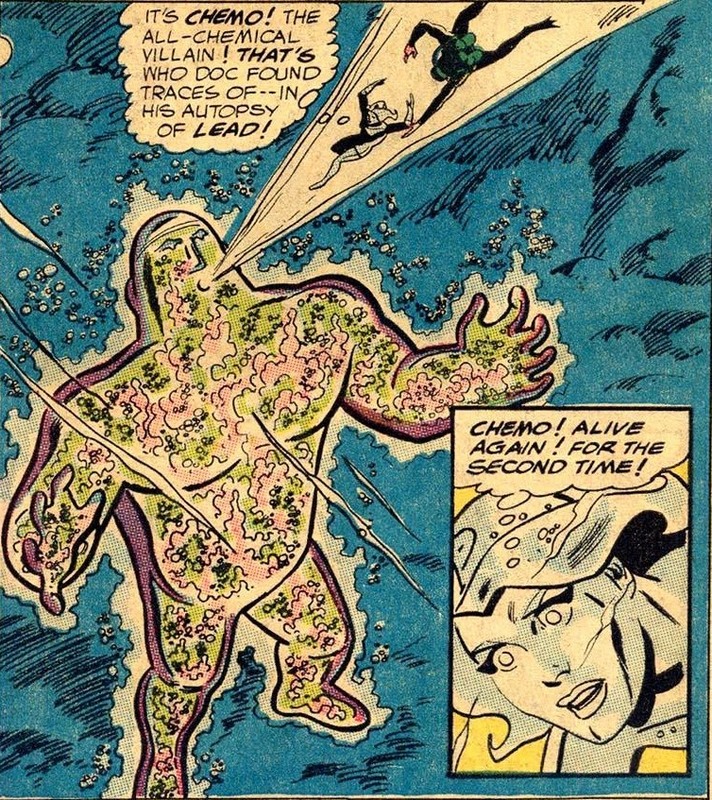 The contents of Chemo’s mass may be unknown, but it is a safe bet to say that something in his toxic spray could compromise each of the Metal Men. What Chemo brings to this rivalry is the unknown, or rather, the untested. In essence, the rivalry between the Metal Men and Chemo comes down to the processes that led to their creation. The Metal Men were intentional – a deliberate series of experiments that were observable, measurable, and most importantly reproducible. Though their personalities may surprise, their existence shouldn’t. They represent the constancy of a successful scientific process. It is likely that whatever experiments Doctor Norton was working on were equally rigorous, but the disposal of his failures was not and the result was the rampaging Chemo. Chemo is a volatile variable. He cannot be accounted for nor predicted. He cannot be reproduced and therefore can never be fully understood. If the Metal Men are the payoff for careful calculation and experimentation, Chemo is the terrifying and risky unknown. Both are ever-present in science and both can yield incredible results – some a boon and some a bane. These opposing forces – diligence and negligence – are represented in this iconic rivalry which stands as both a salute to and a warning of what scientific inquiry can achieve. **This article was originally published on Modern Mythologies.